We’re back – and straight to business. Paul “Dead Eye” Kennelly takes the plaudits for last time with the following sequence: 1. Bg4+ Kd6 2.Bxe5+ Kxe5 3. Qb2+ Kd6 4. Qh2 Kc5 5. Qc7 and mate. An interesting game from the 2016 Baku Olympiad, Indij v Cruz. If 1. … c6 (or Bd7) to cut off the diagonal and access to r8, then 2. Ne5#. If 1. … fxg4 capturing the queen, then 2. Be8+ Kf8, Bh5#. If 1. … Nc6 then 2. 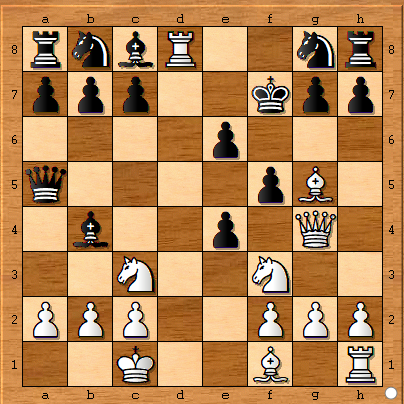 Ne5+ Nxe5, 3. Be8+ Kf8, 4. Bh5#. And finally if 1. … g6 to create space for the king then 2. Qh4 and there are a few variations involving some of the above with the option of finishing off the king on g7 square with the dark sq. bishop giving the mate on f6. Cancel the very last paragraph, there is a knight in g5. :-/ I’ll try to solve that later. 3. … h6, 4. Rxh8+ If captures with rook check mate in one (Qh6#) if captures with king then Nxg6 lead to check mate in few moves.